Today I am sharing again from a small business – The Market Boutique! 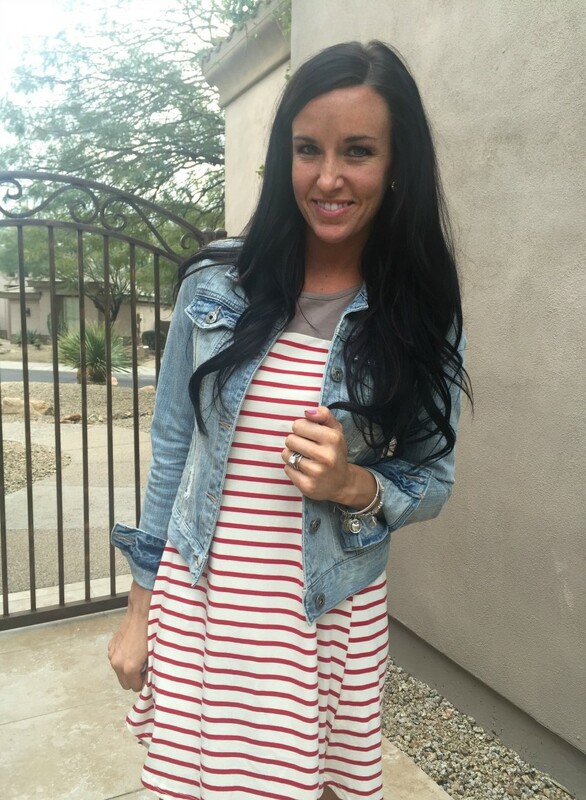 I am featuring their short-sleeved Harper Striped Dress in Taupe and Red. With the cooler winter/spring temperatures that are often still surrounding us, I decided to layer the dress with a light-wash denim jacket. I wore my favorite OTK boots, too, and it brought out the taupe color in the dress. This dress is quite a bit shorter in the front, so my OTK boots worked fabulous! It has a high-low hem, with a blousing detail on the back of the dress between the shoulders (seen in the website photos here). Some other ways I thought about styling it for our current season would include a black faux-leather moto jacket with some black boots or booties and a bucket bag. Shop this directly from the carousel below! *This post was created in collaboration with The Market Boutique. All opinions are my own.